For a month this past summer, sustainable fashion blogger, Aditi Mayer, lived in the foothills of the Himalayas on an all-women farm. She worked the fields, milked the cows, traversed the hills for bamboo and cooked with these ingredients gathered from nature. The women, Mayer noticed, were navigating what she knows as a zero-waste lifestyle. They source from their own gardens and take from the earth only what they need. But they don’t have a name for the way they live; sustainability is inherent to their culture. “Being in the West and working in the sustainable fashion industry, sustainability is something that’s always seen through the lens of consuming,” Mayer said. Mayer focuses the overlap of style, sustainability and social justice through her blog, ADIMAY. Standing at this intersection, Mayer is able to continue her need to create as an artist “without sacrificing the world’s dire need for justice,” she said. Mayer in Jaipur, India wearing Inde Rooh and earrings from Anoma. Mayer created her blog the summer before college in 2014, originally as a platform to showcase her photography. Her love for the craft began when she was 12 years old, but she became especially interested in fashion photography upon entering college. During her first year, Mayer got involved in shooting for an ethical fashion brand as part of an internship. This marked her first step into the conversation, of which she is now a leader. Working on the farm, Mayer was able to practice living sustainably and share her love for photography. Besides shooting her own content, Mayer taught girls photography as a way to continue the community’s value for storytelling. The women, many of whom come from backgrounds of poverty and domestic abuse, use photography, film and radio to amplify their narratives. Through her time on the farm, Mayer was reminded of the importance of guiding dialogue beyond the consumption realm of fashion. For her, being a blogger in the sustainable fashion industry requires more than researching the most ethical brands to share with her audience. Mayer’s first morning at Her Farm Nepal. As an LA native, Mayer is especially invested in the undocumented labour that happens in her city. 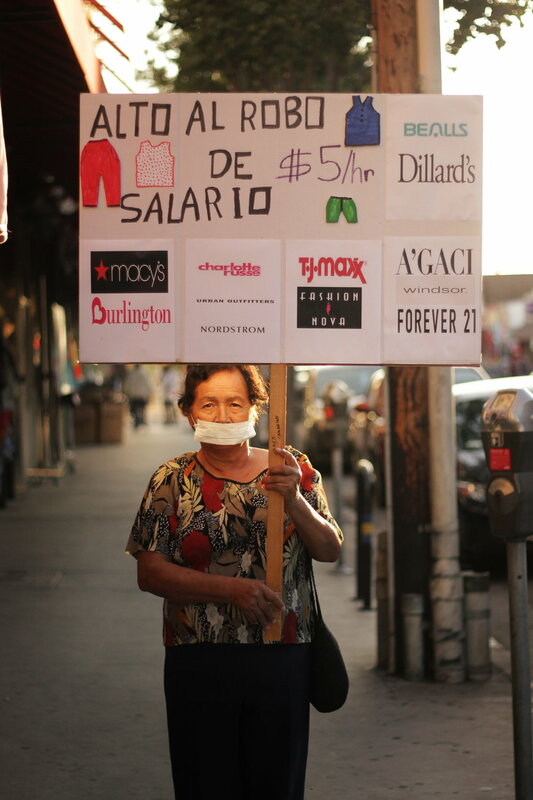 As one of LA’s largest manufacturing employers, the garment industry is an employer of many undocumented immigrants. Through speaking with these undocumented workers, Mayer learned that they are paid at a piece rate of three cents, or an hourly wage of just five dollars. Although California law requires undocumented workers to be paid the minimum wage, Mayer said the workers are often intimidated into silence and compliance through threats of exposing their illegal status. “Fashion is often all about showing the beauty of art and craft, but there’s very real issues going on when it comes to poverty and inequality,” Mayer said. One of Mayer’s upcoming projects consists of working with LA garment workers to create a series on what they experience in their work environment, and what they want consumers to know. Here, the issues of immigrants’ rights, women’s rights and labour rights all intersect under the umbrella of the fashion industry. Despite her successful efforts of retaining a wide audience through visual means and social media, Mayer worries about how much action she is really inspiring. “From the activism perspective, I can talk about an issue, but is anyone going to do anything about it? Are we really taking our enthusiasm off our phones and into the real world?” Mayer said. In the past year, Mayer has been participating in more speaking engagements and becoming more active in community organizing, such as with the garment workers in LA. She believes it is through these in-person interactions that her voice will become most effective in creating change. Although Mayer acknowledges that awareness of sustainability and ethics is spreading in the fashion industry, she is wary of being too optimistic. Fashion houses have begun to enter the conversation and change their policies, but sustainable and ethical standards remain optional for high fashion and mainstream fashion brands. Yet consumers continue to view them as the highest standard, regardless of their policies. Mayer in Jaipur, India, again, wearing Inde Rooh and earrings from Anoma. “We’re pushing the needle, but it’s going to take a shift in consumer mindset to really change things,” Mayer said. Neither Mayer, nor anyone else, has the answer to what’s next for the fashion industry. But Mayer is doing her part in shaping a path where sustainability and creativity merges into one, and where ethics and transparency, rather than discrimination and exploitation are the expected principles.